I promised to write about this participant in our Michigan vs. Mosel Riesling tasting seperately for two reasons. First, I want to talk about the Scharzhofberg a bit more, because the vineyard matters to me, and second because I want to talk about the winery in a bit more detail. The Scharzhofberg is a vineyard along the Saar, a tributary to the Mosel. The Saar meets the Mosel just south of Trier, in the town of Konz. The Saar commences in France and then flows into Germany. It is a mere 246 km (152 miles) long, but only the final parts in the state of Rhineland-Palatinate are used for growing wine, mostly riesling. The Saar is known to produce more mineralic, somewhat tarter rieslings than the middle Mosel. The microclimate is cooler than at the Mosel, so the grapes tend to ripen later and can reach acidity levels without the higher sugar levels you can find on the Mosel, which gives them a distinct character. Most of the vineyards belonged to the church, but in the course of the secularization in the 19th century, many private investors bought plots and began wine making. Rich families began to settle later in the 19th century which led to the term “Saarbarone” (baronets of the Saar, a term derived from “Ruhrbarone” which was used for the industrialists in the Ruhr area that made a fortune when the industrial revolution took off). A lot of the estates on the Saar are very grandiose, unlike most Mosel estates. The Saar boasts many prime vineyards like the Kanzemer Altenberg, Ockfener Bockstein, Ayler Kupp and also, the most prominent among them, the Scharzhofberg. Technically belonging to the village of Wiltingen, the vineyard is so prominent, that the wineries do not have to list the village name on their labels. They proudly just use “Scharzhofberger”. The area stretches over 28 hectares (around 70 acres) in steep slopes (30 to 60 degrees) towards the South, the soil consisting of slate with rocky soil with iron and clay. Only riesling is grown here by a few producers that read like the who is who: Egon Müller-Scharzhof, van Volxem, Reichsgraf von Kesselstatt, von Hövel, Bischöfliche Weingüter, Vereinigte Hospitien as well as Johannes Peters and Weingut Resch. The most prominent producer here is Egon Müller, a star among German winemakers, whose wines command the highest prices in the business. I just checked some of the prices in German online stores: a bottle of Kabinett $40, spätlese $170, auslese starting at $250. That is a LOT for Germany…I have not had an Egon Müller, but I sure hope to try some at some point. Other Scharzhofberger are more affordable. The Bischöfliche Weingüter, that produced the spätlese I want to talk about here, is a rather unique winery. As its name indicates (Episcopal Wine Estates), the winery belongs to the bishop of Trier. It manages and produces wines for the estates Bischöfliches Priesterseminar (Episcopal Priest Seminary), Hohe Domkirche (High Cathedral), Bischöfliches Konvikt (Episcopal Convent), and Friedrich-Wilhelm-Gymnasium (Grammar School Friedrich-Wilhelm). In the middle ages, the church partly financed itself with producing and selling wine. I mentioned in an older post that the same was true for universities. The church therefore had vast properties, often in prime locations. Separate branches of the church had separate lots. As the names of the estates indicate, the proceeds went to each separate institution. During secularization, the church was forced to sell most of its properties, but the Bischöfliche Weingüter bought back lots when the chance arose in the mid 19th century. The Bischöfliche Weingüter today own over 130 hectares (320 acres), which is a whole lot in Germany. The Hohe Domkirche consists of 22 hectares in two locations: the Scharzhofberg and the Avelsbach estate close to Trier. They now have a modern tasting room in Trier, and their wines have gained a better reputation over the last decade. 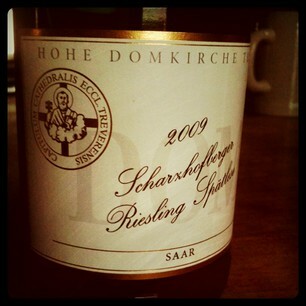 This 2009 Hohe Domkirche Scharzhofberger Spätlese was given to me as a parting gift by one of my best friends in Trier. 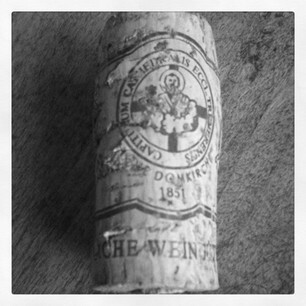 She knows how much I love Scharzhofbergers, and she has been a “Weinfee” (wine fairy, i.e. pourer) at the Bischöfliche Weingüter to help finance her degree. So, what better way to make me miss her than giving me a bottle of my beloved Scharzhofberger. I usually buy the Vereinigte Hospitien version, and have a couple in my cellar. We opened the wine and first up to admire is the beautiful cork art. The Bischöfliche print the three coat of arms of their wineries (Convent, High Cathedral, and Seminary) on the cork, and them being rather elaborate, it looks gorgeous! Pouring the wine into our glasses, it showed a light yellow color. On the nose I got very creamy, perfumy notes, then almonds. On the palate, the wine initially showed ripe strawberry and some cream. It had a very long finish, and there was a depth to it that was beautiful. After a while, I got more aromas of mango, and other tropical fruit. It was a very pretty wine. Two participants in the tasting told me later that it was their favorite of the evening, which I might sign up to, but I was still so impressed with the Michigan rieslings that I do not want to make that statement. If you ever get a chance, give a Scharzhofberger a try. I have yet to be let down by a single bottle of it. Just beware: All vineyards in the Saar valley that do not have their own name (aka are not renown) can use the name “Scharzberg” on the label. These wines usually have nothing in common with the Scharzhofberger steep hill beauties, because they are usually from flatter plots and often lower quality land (thanks to Rob for that info!). So, watch out when you go hunting! There’s so good info to absorb here (and this is not a good week for “absorbing” for me). I’ve printed it (yes, I killed a tree) for later perusal with my husband, when we’re looking for something new to try. Are the Scharzhofbergers very available here in the States? (I already know better than to look for them in my town–this just isn’t a wine town). It looks like the Scharzhofbergers are quite readily available in the US. I just checked here: http://www.wine-searcher.com/find/scharzhofberger/1/usa , and you can even narrow the search by state. The von Hovel should provide excellent value, I am not a big fan of Kesselstatt, and the king of kings is Egon Müller…good luck hunting! And let me know how it ends. We used to have a huge cellar, but we’ve downsized 3 times (we’re trying to prepare to live on a boat for a few years) and our current place is a temporary one, so we have to rely on our local merchants for now and the foreseeable future. Unfortunately, we haven’t found a good store near us… but there are a few new wineries in the state, educating and inspiring people, so we’re still hopeful that someone near us will start stocking more variety. Schwarzhofberger sounds wonderful. I’ll have to look for it. Do you ever drink Rhine Rieslings? I have distant cousins who run the family winery in Rheingau. Just to be sure, it is called Scharzhofberger, without the “w”. It’s Balthasar Ress Winery in Hattenheim. Have you heard of it? I had not heard of them, but now just checked them out. 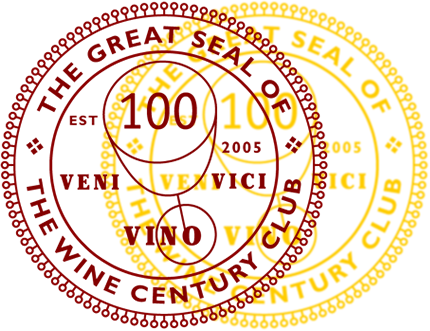 They are a member of the VDP, Germany’s elite wine association which tends to be a good sign for quality. Wine guide reviews quite decent, too. You should visit them!! !